I believed many of you out there have heard of Taobao and know the variety of stuffs they offered in Taobao. From clothings (Male & Female) to household items and furniture, whatever you name it you can find in Taobao. For the past few years, I don’t just buying fashion clothings from Taobao, I also bought some unique gift packs and items for my friends and colleague during Christmas. I know it’s still early for Christmas but it’s good to plan early, I’ve already purchased some gifts containers in Taobao currently awaiting for 65daigou to deliver. Besides, it’s a marketplace where you can find anything & everything, it also provides the most affordable and economical pricing. You can never purchase items in wholesale price in online and physical retail store with little quantity. 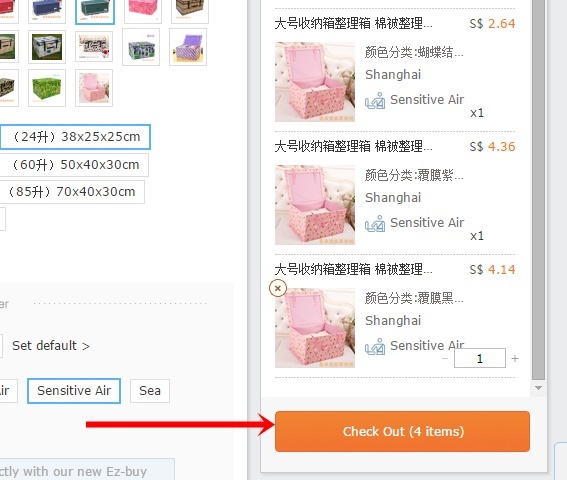 In Taobao, you can purchase the item with no minimum quantity in wholesale price! With just 1 click, you can conveniently shop at home! Now which agent I preferred for shopping in Taobao. I would highly recommend 65daigou, I have been using 65daigou since the day I started to shop in Taobao. 65daigou is the most reliable and trusted agent in Singapore, they offered prompt services and have over 130 neighbourhood and 14 MRT collections points at Free of charge. And also provides affordable delivery charges to deliver your parcel to your doorstep! Why 65daigou but not Taobao direct shipping? 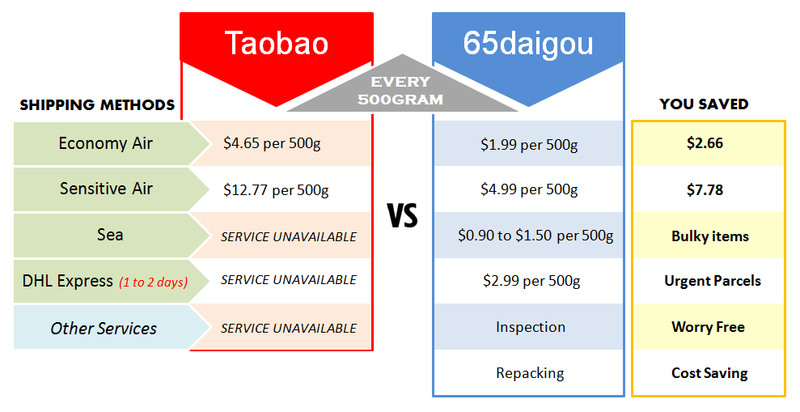 You can see from the comparison table above, 65daigou will be the best method for you. I’ve also heard horrible stories from my friends that shopped direct with Taobao, items did not arrive, wrong item arrived and seller refuse to do exchange. All these you have to do the coordination with the seller and communicate with them in Chinese. But with 65daigou, you don’t have to worry about the liaising with sellers, they will coordinate with the seller for you and highlight to them any special instructions you have indicated. Gives you the latest updates on unavailable stocks or sellers got no reply. 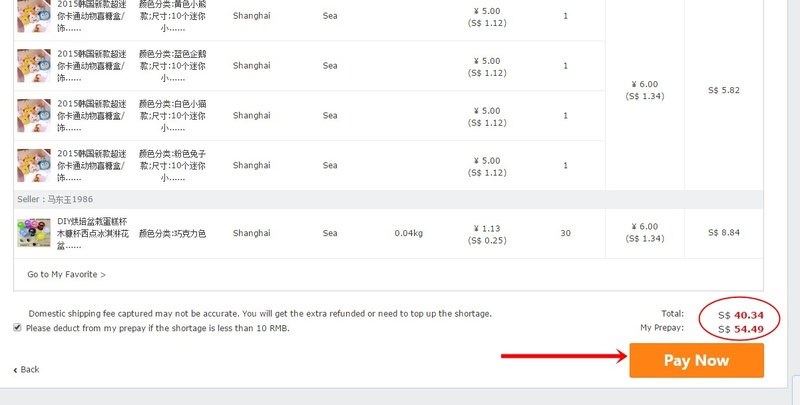 65daigou will refund the money you paid if items didn’t arrive to their warehouse. Provides cheaper shipping rate for economy air and sensitive air. Bulk items? No worries, 65daigou has sea shipment for you. Or you need the items urgently? Express air via DHL (only 1 to 2 days shipment), at affordable rate of S$4. *Best suitable for small urgent parcels. The only cons by using 65daigou is we have to pay a 4% – 8% of agent fees (depends on membership). But with all the great and reliable services they provided, I don’t mind paying them the agent fees, definitely worth it. Compared to the older verison of 65daigou website, they have improved in some of their features. 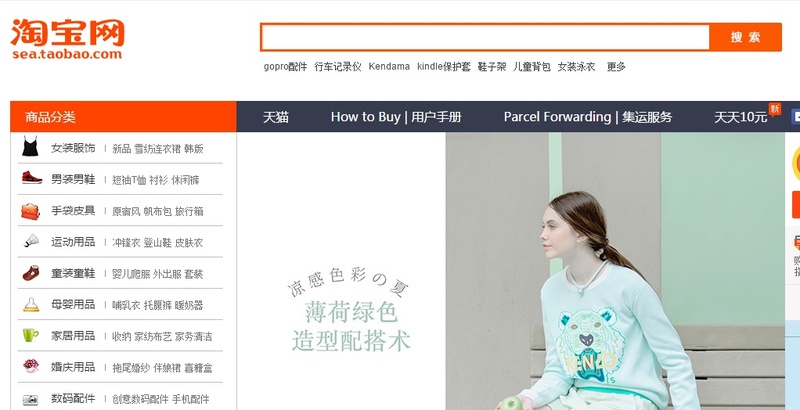 New mobile app feature – “SURF” Enable user to shop Taobao directly through 65daigou app. How to shop via 65daigou? Step 1: Create an account in 65daigou, if you already have an account, please sign in. 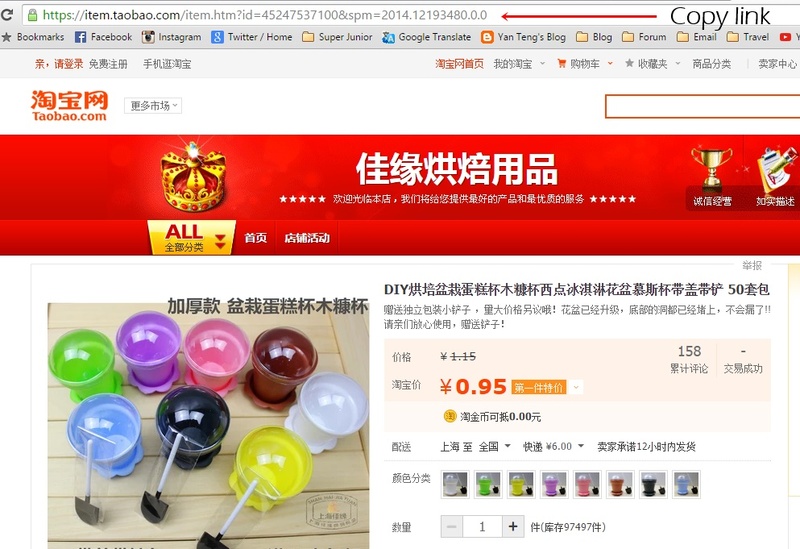 Step 2: Access Taobao.com and start searching for items you want. You may type the keyword of the items you want to look for on the search box or browse through the categories on the side bar. Step 5: 65daigou will generate the price of the item in RMB. 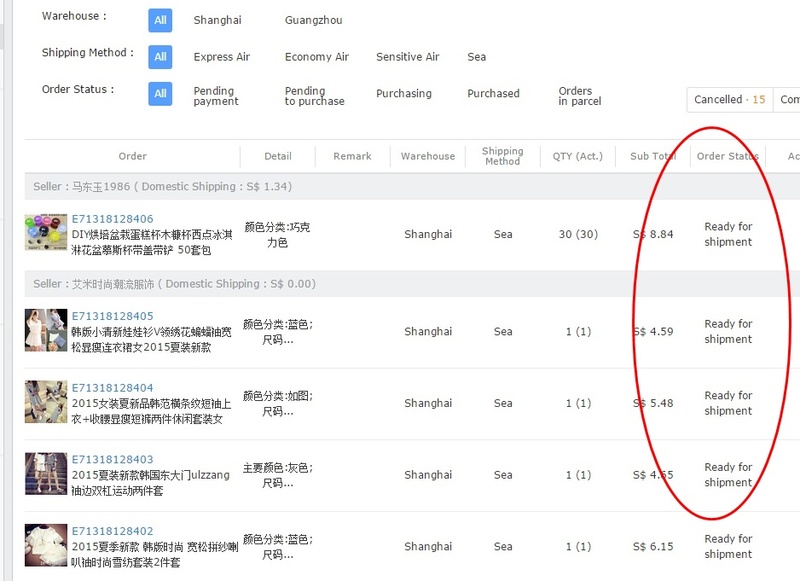 You can see the seller location which enable you to decide which 65daigou warehouse to ship to and the shipping method. For this item, the location is near Shanghai, so I choose the Shanghai warehouse. Some seller provides Free domestic shipping if its within the same province or city. If you want to take a look at the actual site again, bottom left provides the link back to the original site. Choose the colour you want to purchase and key in the quantity in this step too. And lastly click on Add to Cart. Once you added the item to cart, on the right panel, you can see your item being listed there in SGD. You may repeat Step 2 to 4 for adding more items. Step 5: After added all the items you want to buy in the cart, it’s the Check Out step. Step 6: Check the amount in SGD again and click Check Out. Step 7: The site will brings you to the payment page. You need to top up My Prepay account in order to make payment. My Prepay account can be topup via IBanking Transfer, ATM Transfer, Credit Card or Paypal. Step 8: After payment, it will direct you to the order status page, where you can see all the items status. Step 9: You can check back the status page after few days. Once all items has arrived the warehouse, you may arrange for shipment. You can see the total and chargeable weight, shipping fees and agent fees will be generated at this point. Step 10: Check the ETA date. On the left panel, click on Parcel, you can see all the information of the parcel including the estimated arrival date. Apple Watch Giveaway from 65daigou! 2. 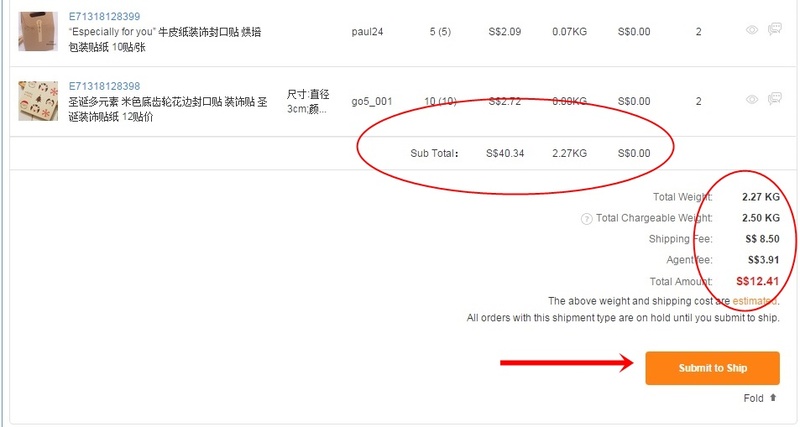 Comment on the giveaway post – Your shopping experience with 65daigou or why overseas shopping with 65daigou can be like a GSS moment every day. 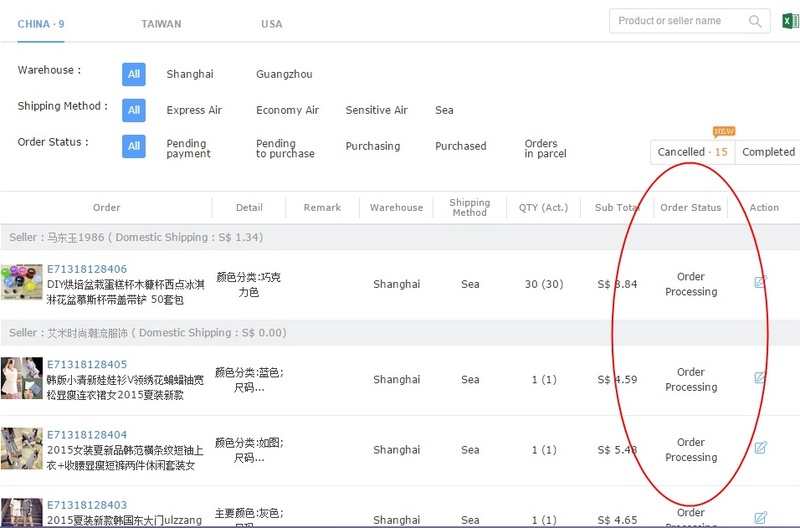 With effect from 29th July 2015, all China shipment (Express Air, Economy Air, Sensitive Air and Sea / Sensitive Sea) for both Buy-For-Me and Ship-For-Me will be revised. I will follow up with another blog post once my items arrive. Can’t wait to receive all my Taobao items!